PM Narendra Modi will fly to Thrissur in Kerala from Madurai to address the next public rally. Madurai: The Prime Minister arrived at the airport about 30 minutes later and went ahead to lay the foundation stone for the All India Institute of Medical Sciences (AIIMS) in Madurai, Tamil Nadu. Addressing the public meet at AIIMS, Modi said that rural roads are being built on mission mode under the government and these roads will lead to poverty-free India by 2022. He further stated that essential drugs are made affordable and accessible to the poor. And, this step is a huge achievement to the goal of healthy India by 2022. Modi also elaborated on demonetisation, digital India and the government’s aim in making the country corruption-free. Meanwhile, the Twitter war between #TNwelcomesModi and #GoBackModi gained momentum. Marumalarchi Dravida Munnetra Kazhagam (MDMK) staged a black flag demonstration against Prime Minister Narendra Modi shortly before he arrived in Tamil Nadu. The protest, which was led by party chief Vaiko allegedly accused Modi of betraying the interests of Tamil Nadu. While the protestors released black balloons and raised slogans against Modi alleging that he betrayed the interests of Tamil Nadu on Cauvery and other issues, the Madurai police officials detained the protestors. In a counter move, BJP youth wing supporters put up posters sarcastically "welcoming Vaiko". 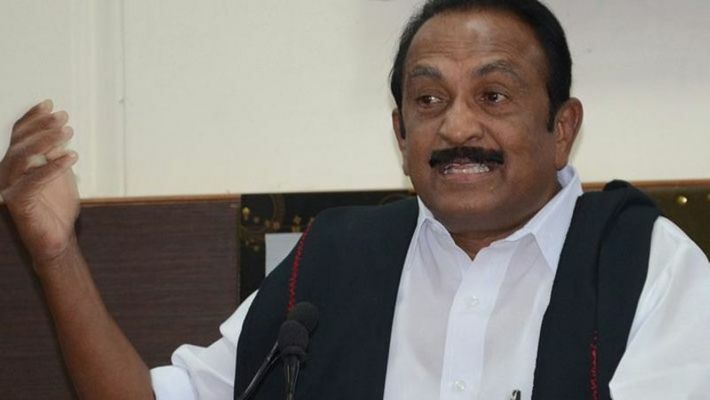 The MDMK cadres claimed that the Centre had accorded "permission to projects like neutrino and hydrocarbon extraction" which, according to them, would have an adverse impact on the livelihood of the farmers and also affect the common people. On the Cauvery issue, they alleged that the Centre was supportive of Karnataka's bid to build a dam at Mekedatu across the river by permitting and preparing a detailed project report. Tamil Nadu BJP president Tamilisai Soundararajan and Union minister of state for finance and shipping Pon Radhakrishnan strongly condemned MDMK for staging the protest ahead of the Prime Minister’s visit to the political capital of the state to lay the foundation for a big project beneficial to its people.